Whole Foods stores are set to be taken over by Amazon later this year, after their merger deal got FTC approval. 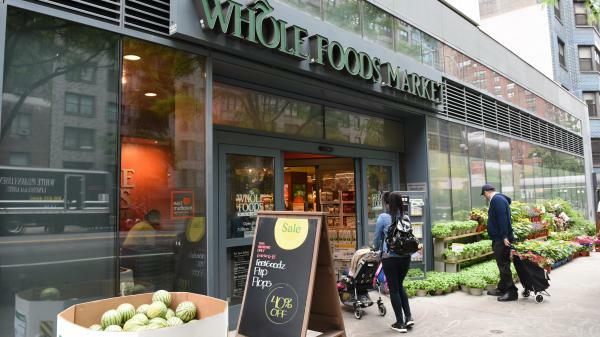 Amazon's purchase of Whole Foods is another step closer to reality, after the Federal Trade Commission decided the grocery deal would not hamper competition or provide an unfair advantage. The approval came on Wednesday — the same day shareholders of the Whole Foods chain approved the $13.7 billion deal that would make Amazon a bigger player in the grocery business. Whole Foods, which opened its first store in Austin, Texas, back in 1980, now has 470 stores in North America and the U.K. The Amazon-Whole Foods merger is expected to close during the second half of 2017. "Based on our investigation we have decided not to pursue this matter further," said Bruce Hoffman, acting director of the FTC's Bureau of Competition. "Of course, the FTC always has the ability to investigate anti-competitive conduct should such action be warranted." Large mergers are subject to review by the FTC and the Justice Department; the review is normally handled by only one of the agencies, based on which agency has the most expertise in the industry involved. As Amazon plans to acquire hundreds of brick-and-mortar stores, Walmart and Google have announced their strategy to compete with the retail giant online. Shoppers will soon be able to access Walmart's inventory through the Google Express web tool — and, similar to Amazon's Alexa service, through Google's Assistant app and Home smart speaker. Whole Foods has also been working to diversify its offerings. The chain has now opened five of its Market 365 spinoff stores, betting that smaller stores with more affordable prices might attract millennial shoppers.